As a species, us humans have become more and more focused on the here and now. Our ability or will to look further into the future has reduced significantly. I seems like we are only concerned with our own personal short term goals. This is especially true in the case of the newer generations. Obviously it is a generalization and there are a large number of people who do not fall into this category. Nevertheless I have noticed this trend, which is growing and becoming more prevalent at least during the little time that I have spent on this planet. 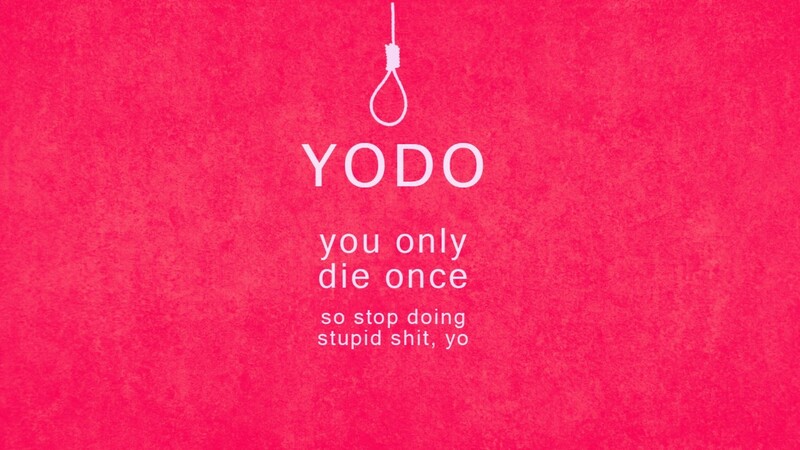 As our society moves into an ever growing frenzy of consuming more, faster and the conquest for short term gratification intensifies, phrases like YOLO (you only live once) have become pop-culture. YOLO is typically used as a rationale or endorsement for impulsive or irresponsible behaviour. With this mentality becoming part of our day-to-day since it is considered as a kind of a “cool/hip” life style. It inadvertently justifies mass consumer behaviour which does not seem to be accountable for any of the long term consequences that stem from this type of unsustainable way of living. I feel that YOLO has become a way to sooth our conscious and relieve us from any obligation or moral duties to the rest of humanity, the environment and to ourselves. A sort of ”get out of jail for free” card which has the power to wipe the slate clean and put our minds to ease. There is obviously nothing wrong with living in the moment and making the best of what you have etc. But there is a difference between enjoying life and when the costs of “living in the moment” becomes our children’s burden to bear. The fact that the abbreviation itself was accepted as an official English word (2012) according the Oxford Dictionary, kind of solidifies the fact that people generally use this word and that it plays a significant role in our society. I mean if you look at the older generations where their main goal in life was to secure their children’s future and where long term consequences and risks played a much bigger role in their decision making. The look at today where you rarely hear people talking about the concern for future generations. It has all become about how to live now without looking at any possible long term effects. We as humans are actively creating and endorsing circumstances where our greed surpasses our compassion for others, where our need to poses is destroying the very environment that we rely on for our survival and where our personal short term gratifications are destroying any possible future for our children. Weather this is because we are all brainwashed by the “system” which thrives on this type of behaviour or because we as humans are unconsciously realising that it is too late to change, so we might as well just use and abuse while it is still possible, is the question.. Are we too paralysed or indifferent by choice that we do not want to try and change our ways? What can be done or can it even be done? Kill some time / Really cool website.